Can Diabetics Eat Sugar Free Candy? One of the most persistent myths is that sugar is off limits to people with diabetes. In reality, if you have diabetes, you can enjoy foods like desserts provided you keep within an overall healthy eating plan. But be wary of claims about sugar-free products like candy. They may have a few less carbohydrates, but often they have just as many calories and fat. In addition, they may contain sources of carbohydrates other than sugar. Sugar-free candies can also cause stomach upset. To safely enjoy sugar-free candy, you need to plan ahead and ensure you stay within the guidelines set by your health care provider or dietitian. You may think sugar-free candy is a healthier alternative. You may need to think again, and you definitely need to read the label. All sugar-free foods are not created equal. Some sugar-free candy is not lower in carbs than the regular version. In addition, sugar isn't the only kind of carbohydrate. Sugar-free candy may contain starch, fiber, and mostly likely a sugar alcohol. Harvard's Joslin Diabetes Center says sugar alcohols aren't technically "sugar" but can be high in carbohydrates. Bottom line -- there's no substitute for being fully educated on everything that's in the food you're eating. The American Diabetes Association says you don't have to rule out candy, provided you work it into your meal plan. For example, you could have candy as a substitute for another carbohydrate-containing food. This will help keep your blood sugar steady and prevent you from feeling deprived. Remember, candy has little nutritional value. The idea is indulge once in a while, in moderation and so as not to exceed your total calories and carbohydrate goals. The association's website for children with diabetes recommends that when they eat candy, they should plan some extra exercise to keep their blood sugar down. 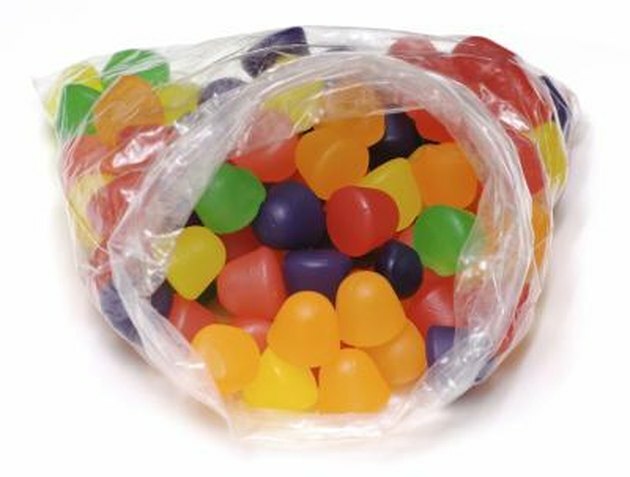 The American Diabetes Association says the sugar alcohols in sugar-free candies vary in their effect on blood sugar. The association provides tips on how to account for the carbohydrates in your meal plan when you eat more than 5 g of sugar alcohol. For example, you should subtract half the grams of sugar alcohol from the total number of carbohydrates. So, for example, if you have a candy that has 12 g of carbohydrates, 4 g of which are from sugar alcohols, you would count two of the sugar alcohol grams and subtract the other two from the total carbohydrate grams. That means you would count the candy as 10 g of carbohydrates. If this sounds too complicated, you could simply have a regular version of the candy and eat a smaller serving. Nina Watson, a registered nurse and certified diabetes educator, wrote in the November 2010 issue of "Diabetes Forecast" that the sugar alcohols used to sweeten sugar-free foods have an "osmotic effect." That is, they pull fluid into the digestive tract, resulting in bloating and diarrhea. Among the common sugar alcohols are xylitol, sorbitol and maltitol. Watson says most people can handle these ingredients in limited amounts, but if you experience these reactions, you should avoid the sugar alcohols. Joslin Diabetes Center: Can I Eat as Many Sugar-Free Foods as I Want? Can You Use Honey Instead of Vanilla Extract When Baking Cookies?